Each box of Duel Power contains 6 new Duel Power booster packs with 5 Ultra Rare cards per pack. 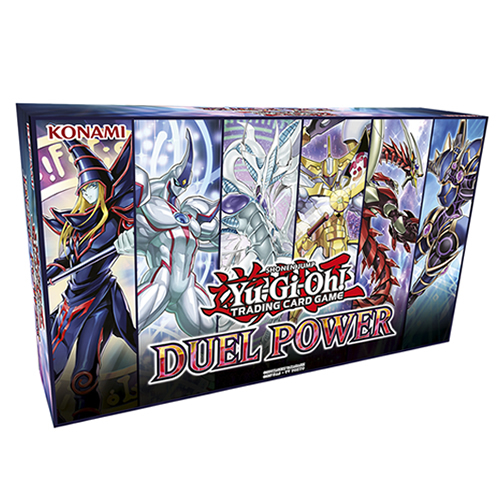 Duel Power booster set includes 40 new cards and 60 hot reprints, including the 4 popular “discard” effect monsters (from Ghost Ogre & Snow Rabbit to Ghost Belle & Haunted Mansion); popular Spells and Traps like Infinite Impermanence, Card of Demise, and Evenly Matched; Link Monsters from Borreload Dragon to Trickstar Holly Angel; and out-of-print cards like Naturia Beast, High Priestess of Prophecy, and 2015’s “Nekroz” Ritual Monsters. Duel Power also provides new cards for favourites old AND new from the Yu-Gi-Oh! TCG tournament scene, like Platinum Gadget, Thunder Dragon Thunderstormech, Beat Cop from the Underworld, Hieratic Seal of the Heavenly Spheres, Aromaseraphy Jasmine, Security Dragon, and Crowley, the First Prophesee. • Each Duel Power booster pack includes 5 cards. • All cards are Ultra Rare rarity. • 1 x Double-sided deluxe game board. • 6 x Duel Power booster packs. • 6 x Ultra Rare alternate art variant cards.